Artists are drawn to maps to express their visions. Using paint, salt, souvenir tea towels, or their own bodies, map artists explore a world free of geographical constraints. 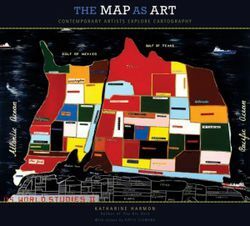 In The Map as Art, Harmon collects 360 colorful, map-related artistic visions by a wide variety of artists for whom maps are the inspiration for creating art. Essays by Gayle Clemans bring an in-depth look into the artists' maps. Together, the beautiful reproductions and telling commentary make this an essential volume for anyone open to exploring new paths.